Practice Area: Driving range with grass tees, putting green, chipping green, practice bunker. This is one of the better practice complexes in the area and frequently offers 1 day clinics. Description: This course is located in Monroe, NC, but far from any main roads/highways. You'll need good directions to get here the first time. 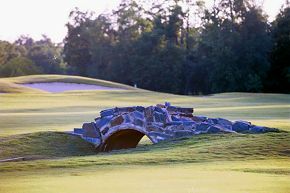 The course features a challenging layout with fast Bent grass greens and water hazards in play on a majority of the holes. B-Man's Take: I try to play this course when I can. It's one of my favorites. Greens are kept in good shape and are the fastest I've played in Charlotte. Bring a soft ball and gentle putting stroke. The course is a fun layout, rewarding long, accurate hitters with several chances at eagle -- the B-Man scored his first career eagle on the par 5 #18. I guess that should be my favorite hole. My hell-hole was the 513yd par 5 #14 hole. With a blind tee shot, this dogleg left then gives you a 2nd or 3rd shot with water and a bunker protecting the green's right side. I look forward to playing here again.